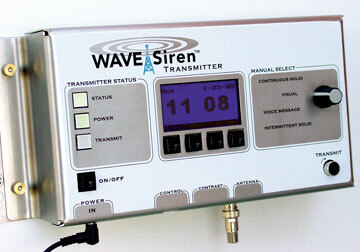 The WAVE Transmitter sends secure codes to activate an unlimited number of WAVE Siren Stations and WAVE Sequencers within a three mile radius. The Transmitter accepts contact-closure signaling for automated triggering during programmable hours of operation. WAVE relies on low-frequency RF communication to operate in noisy environments and over challenging terrain. The WAVE Transmitter offers easy programming through front panel switches and LCD and comprehensive, automatic system status monitoring. 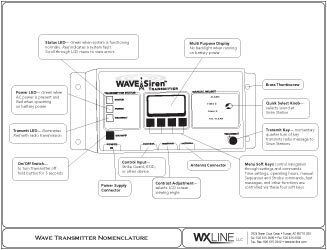 The WAVE Transmitter communicates with the WAVE Siren Station and WAVE Sequencer.